« Do Rivers Have Rights? Our world is shaped by ritual. Hopi/Havasupai/Tewa Grandmother Mona Polacca meets with the “grandmother of performance art” Marina Abramović to talk about the essential role that ritual, repetition, and durational experiences play in reminding of us of our relationships to all things. 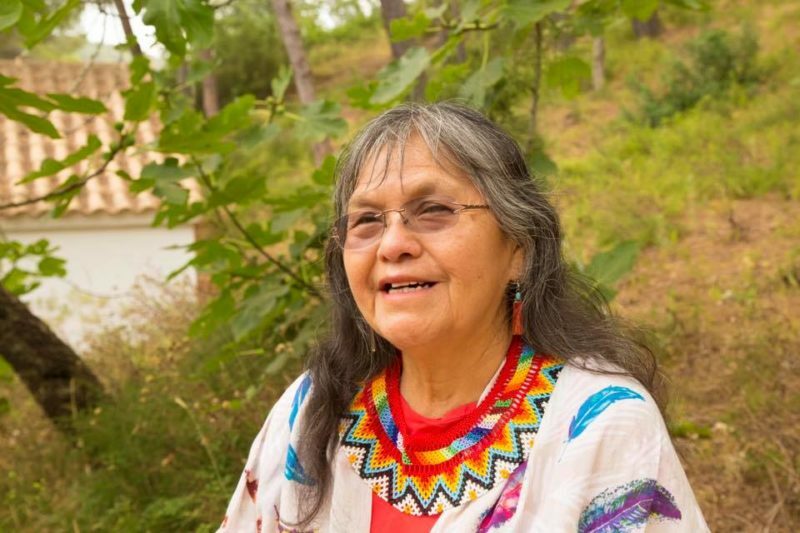 Mona Polacca, a Hopi/Havasupai/Tewa elder, has a Master of Social Work degree and has recently been chosen as a member of the World Council of Religious and Spiritual Leaders in recognition of her international justice work. She has worked on issues of Indigenous Peoples especially related to the Right to Water, social and health issues, and elderly native peoples. Mona serves on several United Nations committees on indigenous people’s issues and is a featured author, speaker, and educator on indigenous people’s human rights, aging, mental health, addiction, and violence. She is also the President/CEO and faculty member of the Turtle Island Project, a nonprofit program that promotes a vision of wellness by providing trans-cultural training to individuals, families, and healthcare professionals. Since the beginning of her career in Belgrade during the early 1970s, Marina Abramović has pioneered performance art, creating some of the form’s most important early works. Exploring her physical and mental limits, she has withstood pain, exhaustion, and danger in her quest for emotional and spiritual transformation. Abramović was awarded the Golden Lion for Best Artist at the 1997 Venice Biennale. In 2010, Abramović had her first major U.S. retrospective and simultaneously performed for over 700 hours in The Artist Is Present at the Museum of Modern Art in New York. Abramovic founded the Marina Abramovic Institute (MAI), a platform for immaterial and long durational work to create new possibilities for collaboration among thinkers of all fields. Her most recent publication is Walk Through Walls: A Memoir, Published by Crown Archetype on October 25, 2016. Her retrospective, The Cleaner, opened at Moderna Museet, Stockholm in February 2017 and is touring to the Louisiana Museum of Modern Art in Denmark, Henie Onstad Kunstsenter in Oslo, Bundeskunsthalle in Bonn, and Palazzo Strozzi in Florence.